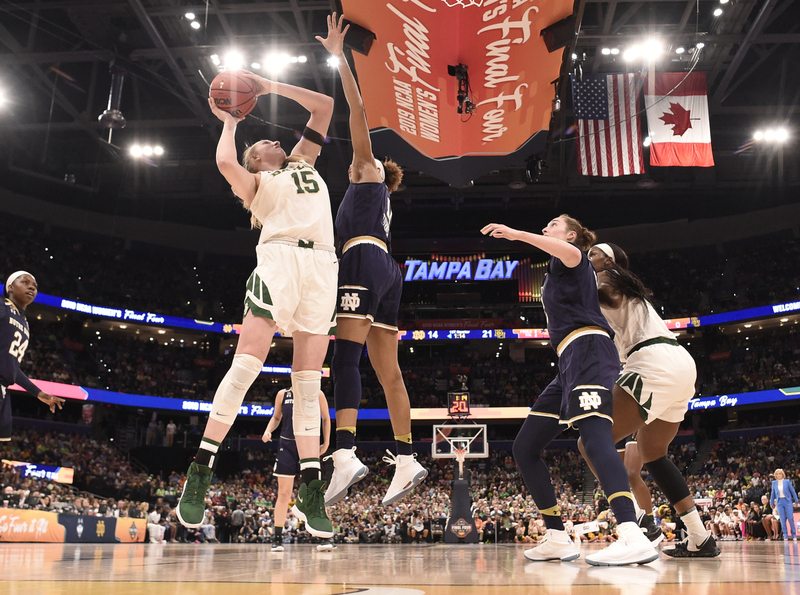 Baylor Wins Against Notre Dame In NCAA Women's Championship The Lady Bears held off the Fighting Irish by a single point, 82-81, Sunday night to seal their third national title. The last time Baylor clinched the title was in 2012 against Notre Dame. Baylor gave up a double-digit lead but hung on in the final minutes to win the NCAA women's title game against defending champs Notre Dame by a single point Sunday night in Tampa, Fla.
With the 82-81 victory, the Lady Bears clinched their third NCAA women's basketball championship — joining UConn and Tennessee as the only Division I programs with three or more titles. The last time Baylor clinched the title was in 2012 against the Fighting Irish. Baylor kept a comfortable lead for the first half, before Notre Dame closed the gap to tie the game in the last five minutes of the fourth quarter. With 3.9 seconds left, point guard Chloe Jackson drove past Notre Dame's defense to put Baylor ahead at 82-80. Then Notre Dame called a timeout and inbounded to tournament standout Arike Ogunbowale. The Irish had a chance to turn the game around when Ogunbowale was fouled going for a layup. But, lucky for the Lady Bears, Ogunbowale missed her first free throw in the remaining 1.9 seconds, leaving Baylor to hold on to the 1-point lead. Baylor managed the final stretch without star forward Lauren Cox, who injured her knee in the third quarter. Cox, who hobbled to the sidelines on crutches to celebrate with her teammates after the final buzzer, told ESPN that she's unsure about the severity of her injury. Cox, who contributed 8 points and 8 rebounds to Baylor's 62-50 lead before getting rolled off the court in a wheelchair, has remained a crucial player throughout Baylor's 37-1 season. Her early exit in the final raised the stakes for her teammates. "We had to do it for LC," Chloe Jackson, referring to Cox, told reporters after the game. "She got us here. We had to finish the job for her." The win brought Baylor coach Kim Mulkey to tears. "I'm emotional for a lot of reasons, but mostly for Lauren Cox, and I'm so happy," Mulkey said. "These are tears of joy, but they're also tears of thinking about injuries." The NCAA reports its highest attendance in 15 years at the Women's Final Four and regional playoffs. That record fanfare was evidenced by the more than 20,000 fans that filled Tampa's Amalie Arena for the final game, as reporter Bradley George of member station WUSF reports.